Create multiple printers – Fixed a bug that caused a 100% occupancy directly after applying several new eDocPrintPro printer. However, the utilization rate was back to normal after a reboot. 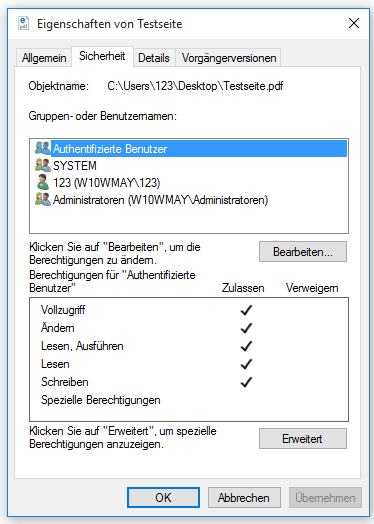 Setup – uninstalling – multiple created printers – The additional Monitor.exe applications were not uninstalled and the “RUN” key was not removed from the registry. In order for this program component has not been replaced or updated when you install a new version. Embed All Fonts – Fixed – If an user had no ADMIN rights the option “embed all fonts” leads to the following failure: in the PDF, the characters have been replaced by “special characters” and so that the PDF was unreadable. Additional user rights on the generated file – PC users without admin rights had no access to the generated PDF files from other users. To enable that, now the full access for “Authenticated Users” is assigned to the created file. 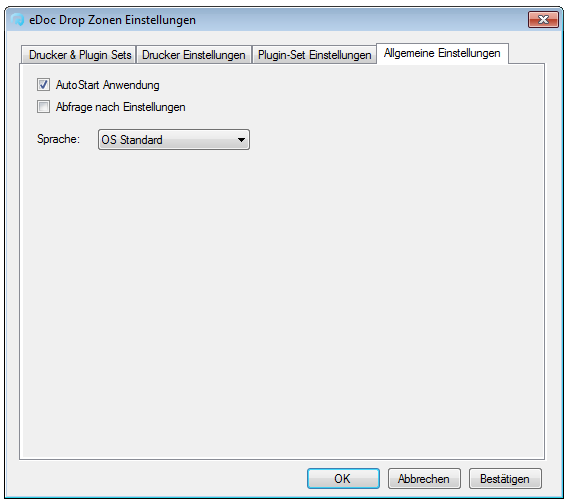 Terminal Server / CITRIX – Seamless Application – Fixed – The default applied “eDocPrintPro” Printer does not generate output file in the “seemless“ mode. However, for additional applied printers with other names, and when used in the TS / CITRIX Desktop it has already worked. MS Office Documents – disable macros: MS Office documents with extensions – .doc, .docx, .xls, .xlsm, PPT, PPTM – may contain macros. Especially if such documents come from external sources, it is possible that malware code is contained in the documents. A good way to prevent such documents are spreading further and causing damage is the conversion to PDF. In the “direct conversion” the macros contained in the documents were also previously ignored. 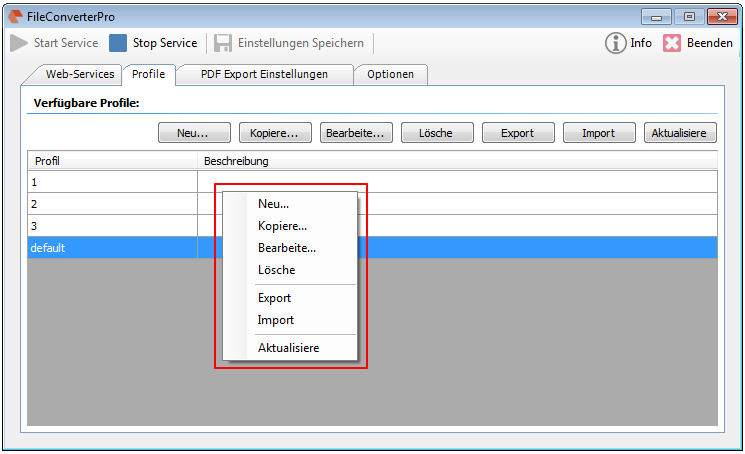 Export and import of all / selected profiles in a * .fcprox file: Previously profiles could only individually exported or imported. With the current version, it is now also possible to export all or all selected profiles at once in a single FCPro file or import from this again. 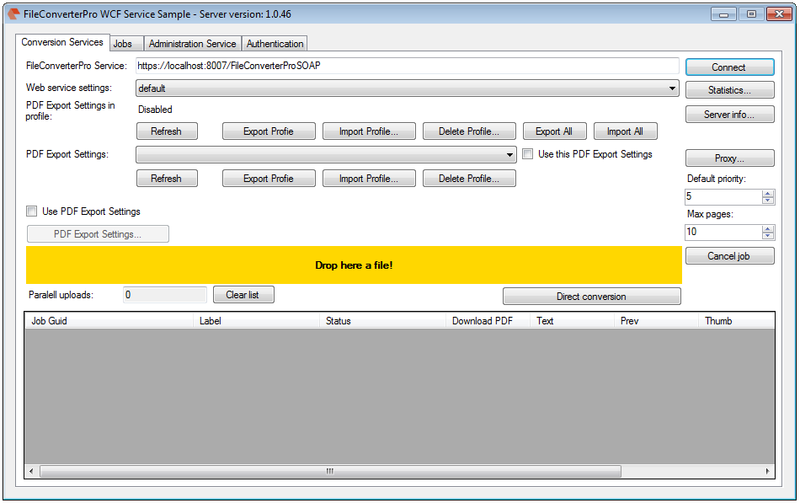 In order for the Batch Conversion Settings / Profiles can be exchanged easily and update between multiple FCPro servers. If multiple profiles are downloaded simultaneously via web service interface, a list of names must be passed separately with comma or semicolon via the parameter “profile name”. e.g. “Default, Profile 1” If several profiles uploaded at once so the “profile name” parameter must remain empty. In this case, the FCPro Server first extracted the ZIP (extension FCPro) where more fcprox files are again included. fcprox files are ZIP files, which themselves can contain multiple files fcprox as container again. 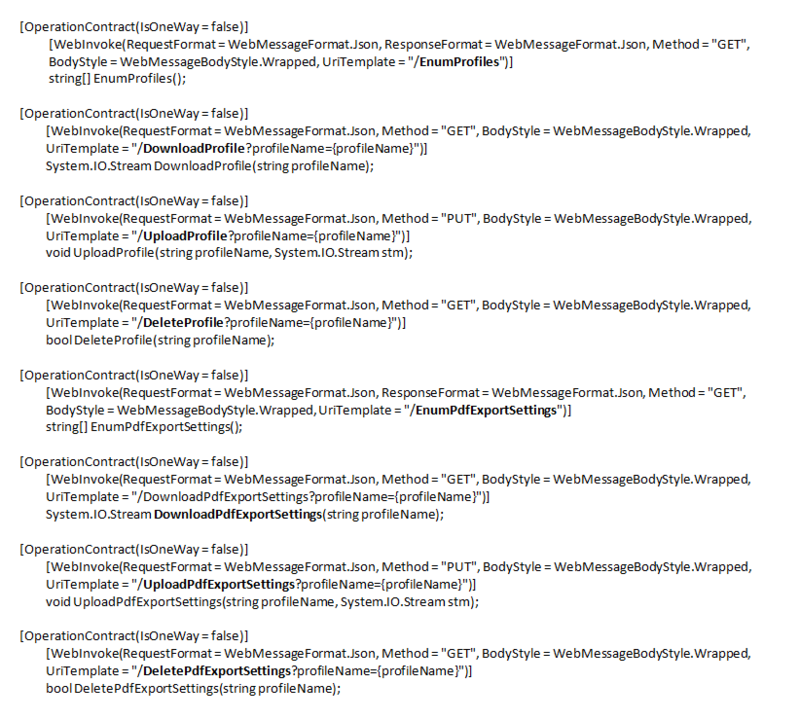 In this way, we can pack either one or multiple profiles in a single file fcprox. Profile update with confirmation: In profile import any or all profiles can be updated after confirmation. So far, the PDF export profiles – * .gfi profile data – could only be changed via a processing profile. Now it is also possible to override this setting via WebService. 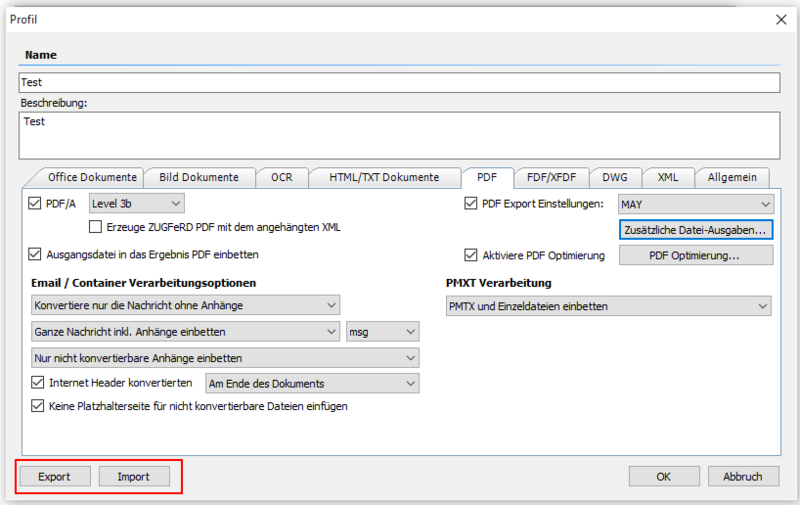 Per job another PDF export profile can be selected or the following PDFExport processing can be disabled. Example project incl. Source code has been brought up to date and includes the newly added functions for management of the profiles as well as for the selection of PDFExport settings regardless of the processing profile. 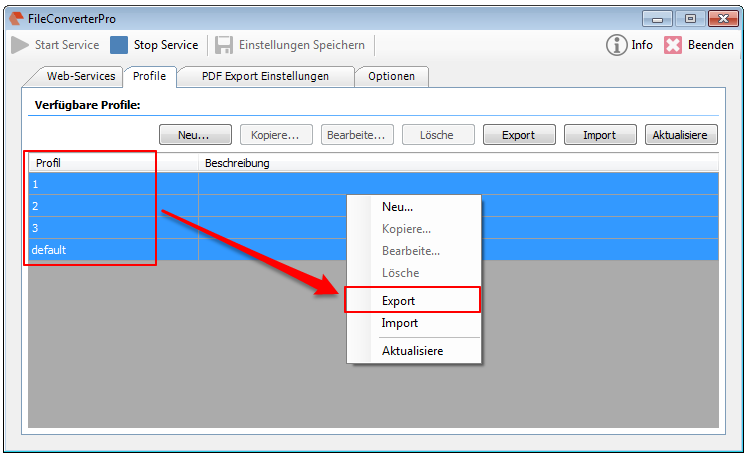 It is also possible to export or import all profiles at once. 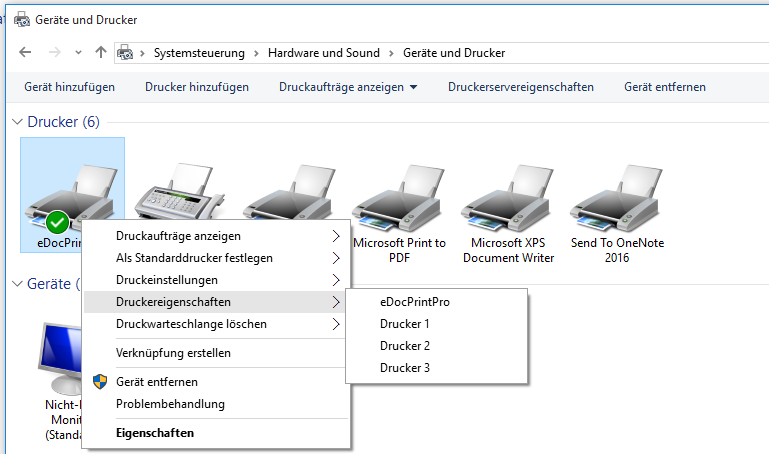 Now all additional and with different settings and names created eDocPrintPro printerderivers will be supported. Each printerdriver can have configured different Plugin Sets. Those individual Plugins again can have different setting again in each printerdriver. 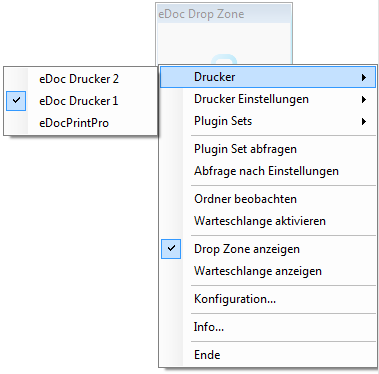 Functions for eDocPrintPro settings profiles (ESFX): import, export, create, rename, delete or activate a configuration profile for the selected printer driver. 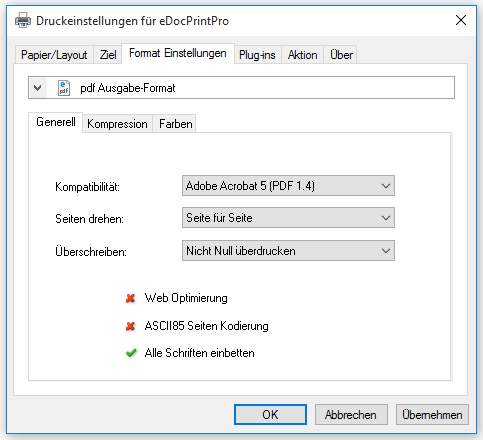 Note: Momentan erfolgt nach der DropZone Plugin Verarbeitung der PDF Datei keine nach gelagerte Aktion aus den eDocPrintPro “Aktion” Einstellungen d.h. es wird falls in den Druckereinstellungen konfiguriert keine verknüpfte Anwendung gestartet, die Ergebnisdatei nicht automatisch in einem Ausgabe-Ordner abgelegt bzw. auch keine Kommandozeilen Anwendung gestartet. 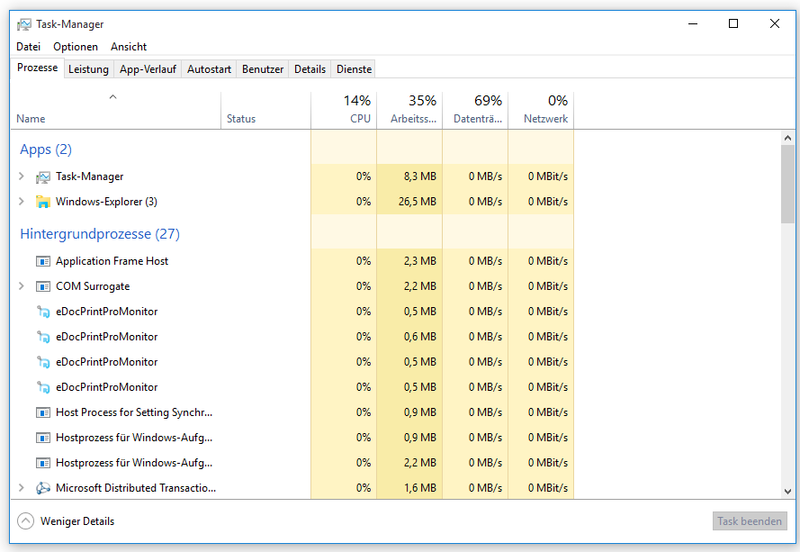 Diese Aktionen müssen über entsprechend installierte Plugin´s durchgeführt werden – z.b. 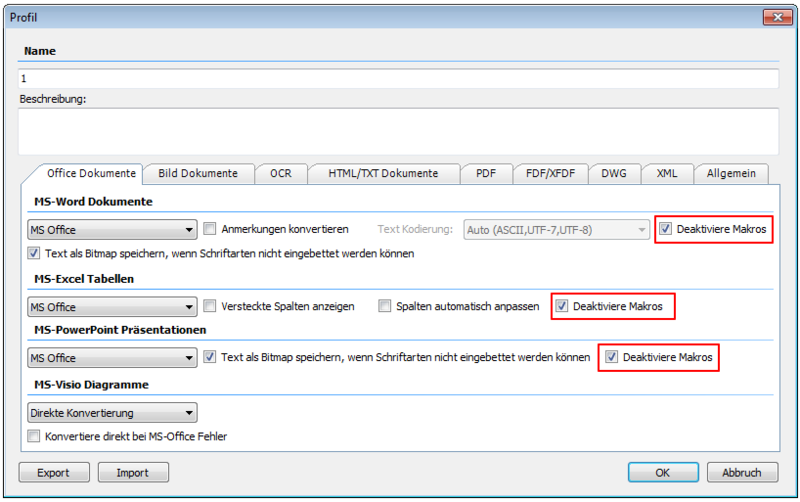 können die kostenlosen Plugins – “Copy to folder” oder “Aktion ausführen” dafür verwendet werden. 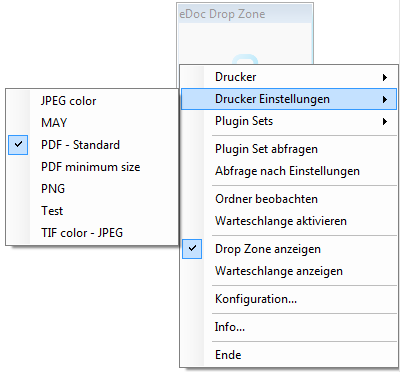 Mit der nächsten Version werden wir die konfigurierten Aktions-Einstellungen des eDocPrintPro Treibers auch über die DropZone verwalten und ausführen. When installing FCPro version 1.0.43 different installation requirements are checked – if they are met, these installation steps are skipped by the setup and not executed. If these components are already installed so they are not loaded and only FCPro is installed. 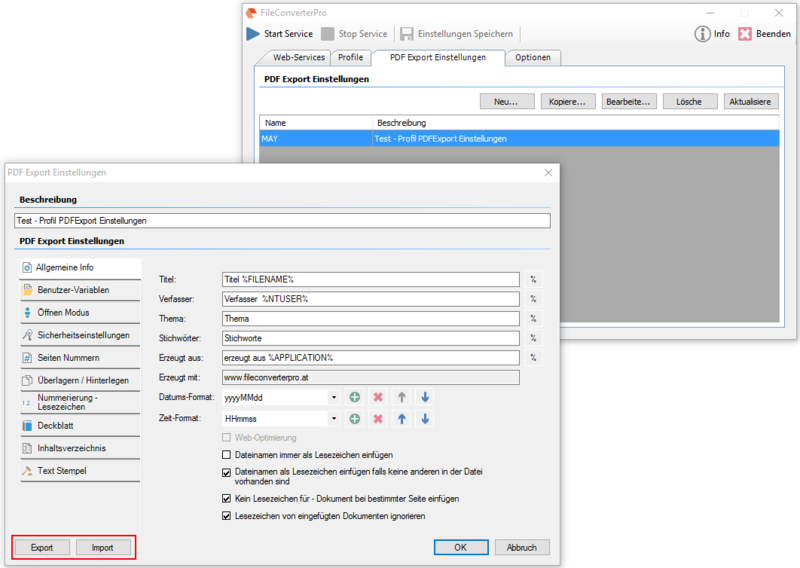 If all or individual components are not present or not in the appropriate version available, so the FCPro Setup tries to reload and install them from our FTP server. That if an installation without an internet connection is to be made, so the Setup’s of these components should first be downloaded and installed in this order. The FCPro settings and the license remain on uninstall / Version Update. Updating of the basic components for the direct conversion and IOCR. 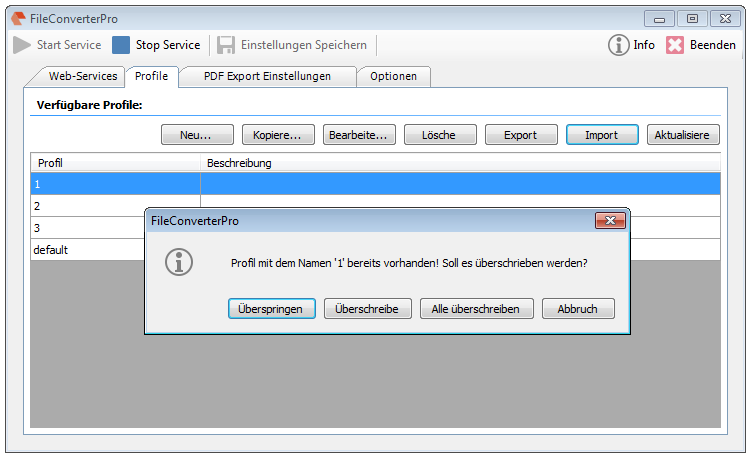 Separating the PDFExport setting profiles of the FCPro processing profiles. These can now independently managed and assigned to a FCPro profile. Features: Enable, Disable, and mapping via list selection. New GFIX extension instead GFI for PDFExport profiles. The GFIX file is a ZIP container that contains beside the GFI-XML file with the settings, now all the files associated with the profile (PDF, DOCX, TOC). In addition to the name can be specified a descriptive text for the PDFExport profiles. 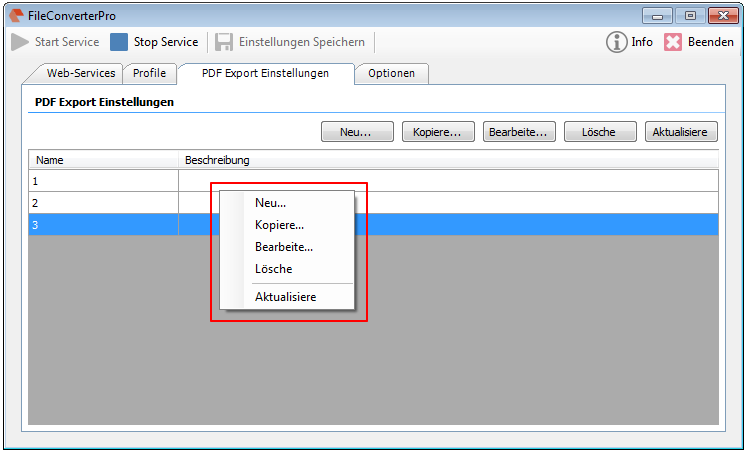 Export / import of PDF export profiles as GFIX files with all related files. Export and import of FCPro profiles via FCPX files (ZIP container with XML and GFIX files) to exchange and update the profiles between different FCPro servers. 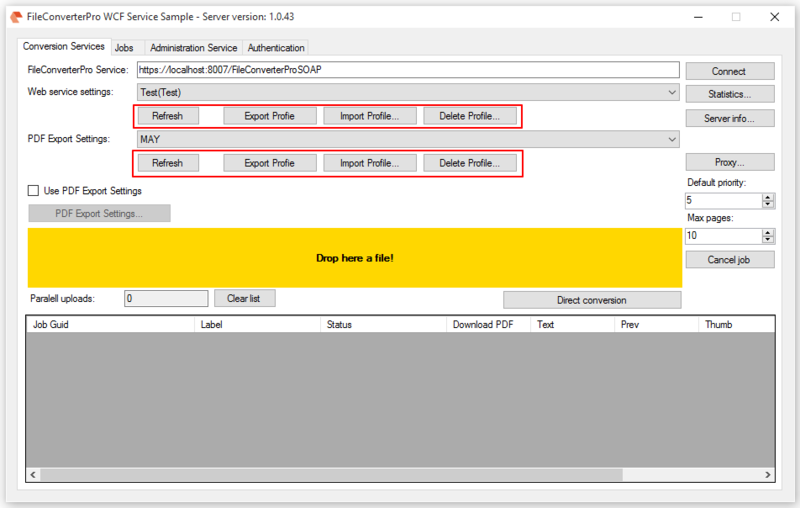 Webservice functions (SOAP / REST) for the management of FCPro processing profiles and the PDFExport profiles (list profiles, delete, export, import). Updated .NET / C # Client Example – Expanded to include the management and export / import of FCPro profiles and PDFExport settings. With Smart OCR processing the existing links in the PDF are preserved. MS Publisher (PUB) is supported by the MS-Office conversion and must be installed on the computer. The PDF bookmarks text for e-mail message and Internet headers are configurable and can be managed through the language profiles. The bookmark for the e mail attachments are now inserted hierarchically below the bookmarks for the email message and not at the same level. Option: Insert Internet headers to the message, or at the end of the converted email. 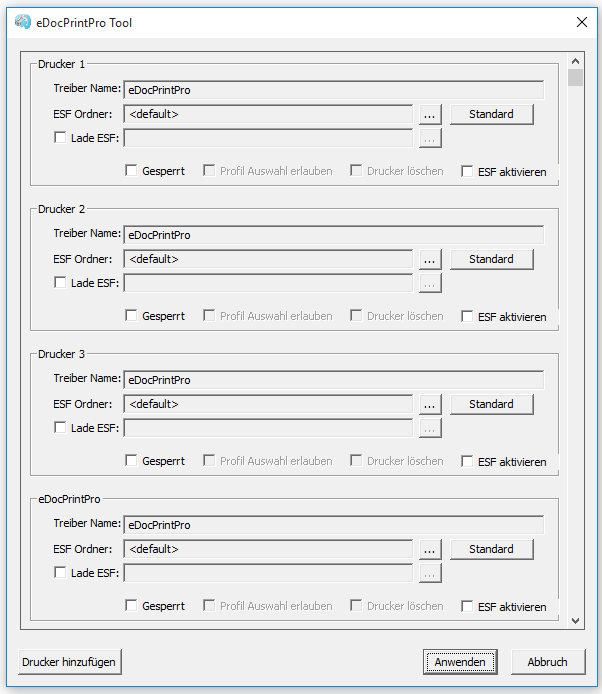 Function: display all available iFilters on the computer for Text Extraction. DWG Converter that is called via command line, there is a timeout option – default on 30sec. adjusted. This helps stuck DWG2PDF processes, according to the set time-out, are automatically removed from memoryn. In the past, several of stopped DWG Converter processes could utilize the FCPro server 100%. Custom separate setup for the OCR component – The setup checks during the installation if IOCR is already installed. If no, it is reloaded and installed via FTP. The FCPro setup becomes smaller. IOCR can be used by multiple applications and must be installed only once. Likewise IOCR updates are therefore easier and the installation of additional languages is therefore possible.